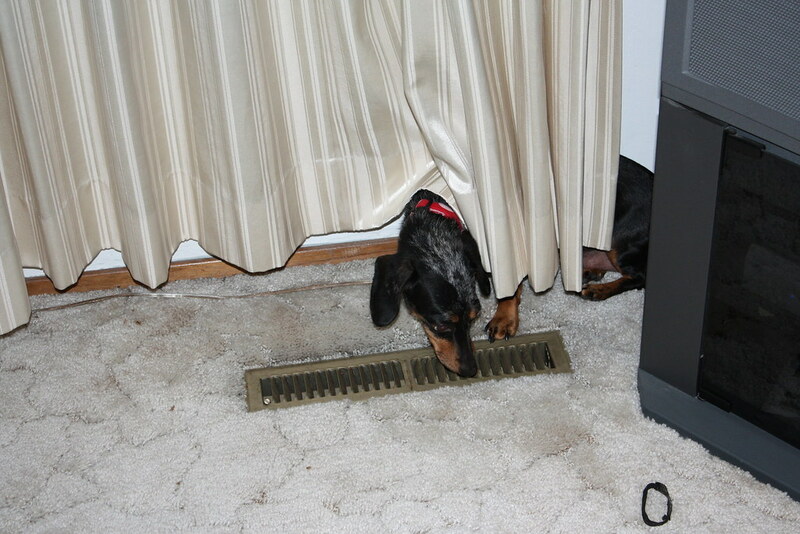 Ben, one of the authors on one of our very favorite blogs, Who’s Your Dachshund, commented on my “Bed Hog” post the other day about not having enough backbone to banish his dogs to the floor bed (even though he wrote about reaching the limits of his dachshund bed-hog tolerance in a recent post). I empathize with Ben. I’m sorry to say that my backbone is, well, starting to crumble. Did you notice that one of the pictures on my Thanksgiving post was of Jasmine on the couch? The ultra-expensive off-white couch with down cushions and eight-way hand-tied oak frame? The very couch that I claimed that Jasmine would NEVER get on because dogs don’t belong on the couch and I would never let Jasmine sleep there? I felt guilty. Hubby and I have been working on the house all week. He took the week off so he could renovate the bathroom and do other odds and ends around the house. We’ve been ultra-busy, running around, painting, cooking, cleaning…and poor little Jasmine’s normal serene routine has been turned upside down. She has reverted to being very afraid of hubby and being worried that he’s going to come at her with an axe as she’s eating her dinner (the very dinner he prepared for her), and she’s been hiding a lot under the bed. She hung out with us at the Thanksgiving table (a few choice pieces of turkey were her reward), and after dinner, she was allowed to sit and sleep on the couch. The guilt got to me. Or maybe it was copious amounts of turkey. Maybe it was because everyone was sacked out on the chairs…and poor Jasmine had been so neglected…oh the guilt. I caved. I set her on her blanket on the coveted couch. She then went into a tryptophan coma. That’s when I snapped her picture. 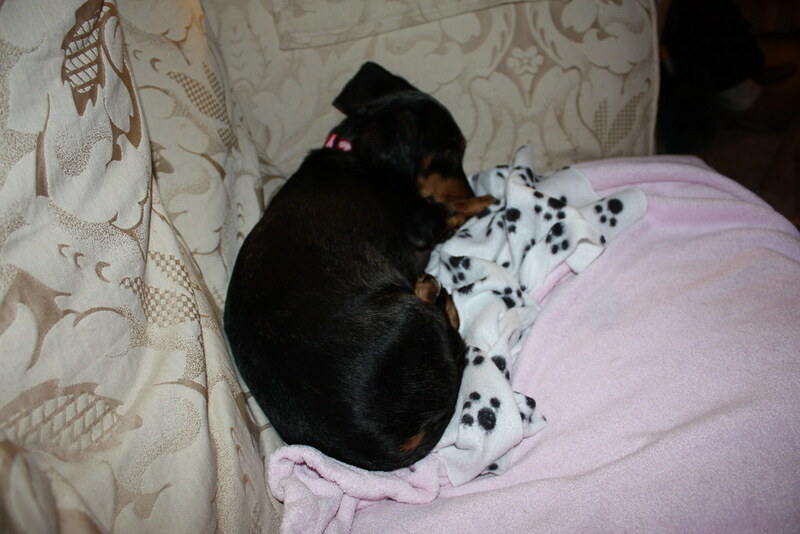 She was so darned cute, nose tucked under the paw, snuggled on her blanket on the couch. Crumble Crumble. She is allowed up on the bed to snuggle, and it’s starting to be a really bad idea. The other night, really the other morning (at 3:30 in the morning to be precise), she decided it was snuggle time. She jumped up on the side of the bed trying to get my attention. She persisted for several minutes. I played ‘possum hoping that she’d give up. Finally, with a loud, jingling full-body shake and a disgruntled snort, she re-fluffed her blankets on her floor bed, plunked back down and went to sleep. She tried again at 4:30 a.m. and hubby got up and walked over to my side of the bed–that made her climb under the bed and allowed us to go back to sleep. At 7:30 in the morning she once again decided it was snuggle time. Of course, I was kind of awake so I let her up. Crumble Crumble. In the afternoon, she kept jumping up on the couch. She hasn’t figured out how to climb up, but she jumps up on the side, places her paws on the edge of the couch, wags her tail and gives me the “happy puppy” look. I tried to pet her and she did the “pounce and run.” She came back and did the “happy puppy” pose again. I KNOW what she wanted. She wanted what she now thinks she’s entitled to–her rightful place on the couch. I guess I’ve been leading up to this point. I’ve been giving her some “Mom time” during the week. In the morning, I sit on hubby’s recliner and drink my coffee and she curls up on my lap and sleeps a deep and happy sleep. I guess it’s a slippery slope from recliner to couch. Crumble Crumble Crumble. So I have a little less backbone due to an unfathomably cute dog that I can’t resist. She just looks at me and I melt. She just lies there and sleeps and I melt. She puts on the cute and she has me wrapped around her little chubby paw. Oh, I’m in trouble, aren’t I? Pre-Turkey Festivities: Jasmine showing her hospitality as she entertains my Mom…er…hides from my Mom. Oh Grandma, what big eyes you have! Oh Grandma...what big teeth...hey, what's that smell? Post-Turkey Festivities: Jasmine OD’s on tryptophan. While we don’t let Jasmine sleep all night with us, we do let her up on the bed for a snooze both in the mornings and before shutting off the lights at night. I’ve read that having the dog on the bed is bad. Placing the dog on the bed puts him/her on the same “level” as you and could cause problems–it could give the dog the impression that he/she is the “alpha” of the “pack.” Also, dachshunds could hurt themselves if they jump off the bed and land incorrectly. Great arguments against dogs sleeping in the big bed, right? Well, the real reason Jasmine doesn’t sleep on our bed is pretty simple–she’s a bed hog. A huge bed hog. She takes up an enormous amount of room for such a small dog. When I let her up in the morning for a short snooze, she pushes me to the edge of our bed–a California King. I have about one body width of space, and she hogs the rest of it. When I try to move her over, she becomes an 11-pound floppy sack of potatoes–lumpy, immovable. She groans with complaint as if I am at fault for her bad manners. Even worse, I move her over and she scoots back to snuggle with me. So, Jasmine is forever destined to be a “floor bed” dog. Unless she learns some big bed manners. And on a separate note, I’d like to wish everyone a Happy Thanksgiving! We wish you much love and happiness this holiday season! Jasmine was a puppy mill breeder. For over three years, she was held in a small cage and had litter after litter. When we adopted her, she had just whelped a litter of 3 little males. A veterinarian from the Bay Area bought her and 48 other dogs at a dog auction in Oklahoma. Before coming to our home, Jasmine had lived a horrible life with no socialization or affection. She was malnourished, her pads on her paws were deformed due to the life of walking on a wire cage floor and she was afraid of everything. Her sole purpose had been to produce a crop of puppies as often as possible. Puppies that ended up in places like Petland. Puppies that are cute, cuddly and are purchased by people who don’t understand that MOST puppies in pet stores are from puppy mills. Given the struggles we’ve had with Jasmine to reduce or eliminate the ill effects of her life before coming to our home, I vow to NEVER support any business that supports puppy mills. Petland’s website claims, “Petland is aware of the many animal welfare issues in the news today. We know that members of some animal rights groups would have you believe that all pet store puppies are bred and raised in substandard facilities. This is untrue. Petland also disagrees with the agenda of animal rights groups that would deny people the right to own and live with companion pets.” They go on to say, “Petland stores are independently operated by qualified franchisees. Each is responsible for choosing healthy pets offered to Petland customers. Petland, Inc. provides each Petland store with humane care guidelines to assist in this important task.” To me, they have skirted the issue. Their argument states that not ALL pet store puppies are raised in substandard environments BUT even if they are, Petland is not responsible; the franchisees are responsible for the dogs they buy. That’s bull*!@&. The Humane Society encourages people to take action and let Petland know that it’s unacceptable that their “franchisees” are buying puppy mill puppies. Let your words and dollars speak! Jasmine wears two ID tags on her collar–her Petco engraved tag with her name, address and phone number on it and her dog license. The nice thing about the tags is the jingle jangle jingle that lets me know where she is. Well, at least when she moves. The bad thing about the tags is the middle-of-the-night body and ear shaking that causes the tags to jingle jangle jingle way too loudly. Jasmine wakes me up out of a nice, comfy sleep almost every night. I love ingenuity. The store that sells the lovely personalized ID tags also sells the Tag Silencer–little rubber gaskets that fit around the tags. They come in 3 shapes–heart, bone and circle. Brilliant! No. I still want to hear my little darling as she creeps through the house. Keeping her close and knowing where she is mostly prevents “stealth pees” and other mischief. Of course, defiant stealth pees also can occur…just like the one she pulled off on Thursday. She peed about three feet away from me. I was sitting on the couch. I looked over and saw a dark spot right next to her doggie bed. *sigh* I didn’t catch her in the act, so I couldn’t scold her. Why oh why doesn’t she just wave her paw and tell me she needs to go? Or was I so engrossed in my web development project that she was trying to get my attention and I didn’t catch the sign? Okay, so I got off topic. Even with the 2 a.m. full-body shakes, I think I’m going to keep the jingling tags. Jasmine is a quiet dog. She doesn’t bark. She is sneaky and I often find her standing right behind me when I thought she was in another room. Without those tags, I think I would never quite know where she was and what she was doing unless she was sitting right next to me (and even then, I tend to not REALLY know). A Stealth Dog requires un-stealthy tags. Sometimes Jasmine does stuff that makes me shake my head in wonder. What I call “nose burrowing” is one of them. We’ve been letting Jasmine come up on the bed at night to snuggle with us before going to sleep. I then pick her up and put her into her own bed when it comes to turning off the lights. During that period, she tends to fall asleep (after some serious pets and scratchies, of course). HOW she falls asleep is what has us so amazed. Jasmine likes to burrow her nose into us before going to sleep. Last night, she decided my arm pit was the perfect place. Several times before, she put her nose into the palm of hubby’s hand. He held her muzzle as she slept. Of course, we get a cold, wet nose and doggie breath. She gets…um…why does she do this? The armpit thing had me laughing. First, I get the nose tucked in there and then the warm, moist breath that followed. Finally, I was serenaded by the snoring that ensued. When she’s in her bed, she doesn’t burrow her nose. It’s just when she’s with us. Maybe she likes our scents. Maybe it makes her feel safe. Maybe she likes the warm air. Maybe she’s just strange. 🙂 Regardless, her little quirks make us smile and make us love her even more. Sunday morning, Jasmine didn’t eat her breakfast. Later, she had the beginnings of some tummy problems. They persisted yesterday to the extent that she soiled the house a couple of times–she obviously couldn’t control it (thank goodness for OxyClean, Nature’s Miracle and Febreeze!). I was concerned that her whipworms hadn’t been irradicated, and I was not about to let it get as bad as it was last time. I called the vet and got an appointment for late afternoon. Jasmine wasn’t acting lethargic or vomiting, but I wanted her checked out nonetheless. She also had developed a second abscess–this time on the bottom of her left paw–and I felt that it would be best to have her checked out. Maybe she knew she was going because she gave me another “sample” to take with me. Yuck. We got to the vet, and she really freaked out when we were walking in. The golden retriever in the waiting room must have spooked her because she became a bucking bronco, trying to get away from the office. I dragged her in and got her situated on my lap. She calmed down a bit but was still shivering. The vet I had been seeing, Dr. Kirsten Krick at West Valley Pet Clinc, went on maternity leave and never came back. So for the past few months, I’ve been seeing the lead vet at the clinic–Dr. Timothy Govers. I really liked Dr. Krick–she was very kind and gentle. Dr. Govers is very nice and he obviously knows his stuff. His exams are very thorough as well. Every time I bring Jasmine in, regardless of the cause, he gives her a full exam. I like that. Dr. Govers spent lots of time examining Jasmine, asked lots of questions, and finally drew some blood and took her sample for evaluation. He also told me that we were doing the right thing with her abscesses. The interdigital cysts were probably chronic, and she would take care of them. If they became infected, we should bring her in; otherwise, they would probably recur over her lifetime. The doctor then gave us some mild antibiotics for the diarrhea, gave her a nail trim (at my request) and sent us on our way. The antibiotics have worked to ease her distres and she’s now doing better. Dr. Govers also called to follow up this morning to check on her and to let us know that her tests came back from the lab–her bloodwork was excellent, and she is negative for all types of parasites. So, her tummy ache was just that–a tummy ache. No whipworm. No horrible disease. She’s fine. And while I feel a bit silly and overprotective (and a couple hundred dollars poorer), I’m glad that I’m now SURE that she’s fine. She’ll have cottage cheese and rice for a few days until all is back to normal. False alarm. We went to the foster home that Jasmine came from yesterday to check out more potential companions for Jasmine. The foster mom had just received two females from a backyard breeder–one of which had just had puppies nine weeks ago. The puppies (two girls and a boy–all three are black-and-tan) were being fostered as well. The two females–Millie and Molly–were very friendly and happy, but a bit undisciplined. Millie is a tweenie red and Molly is a black-and-tan with a tiny bit of dapple in her blood. Molly seemed to be a bit malnourished–she had lots of thin spots where hair should have been. She was also swollen from recent nursing. 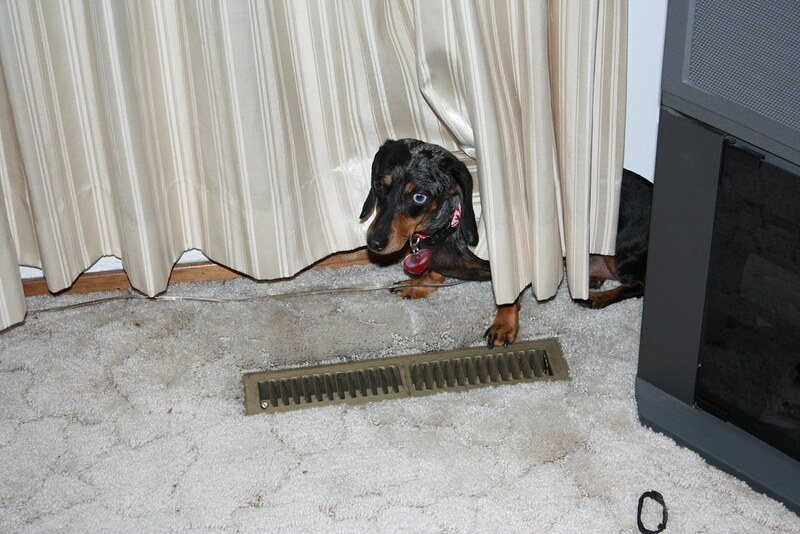 There were several other doxies in residence. Tuli and Mack have already been adopted and are awaiting the renovation of their new home–complete with dachsie ramp. Hank and Bella were rescued from a situation where they were kept outside all the time. They are a bonded pair, and since coming to the foster home, they have adapted well. I liked Hank. He was about Jasmine’s size, and he really liked hubby. The problem was that he once was a pampered boy…and then his family banished him to the outdoors (they had a baby). Because of this, he has trust issues and has been known to snap when scared. He also has issues with possessiveness with food and with handling. It’s going to take some time to build his trust, and I’m not sure that I’d feel that he could be safe around the grandkids. He’s also bonded with Bella…it would be a shame to break up the pair. Bella is a dominant female, and that wouldn’t sit well with Jasmine. Jasmine didn’t want anything to do with any of the dogs. I even had puppies climbing on her. She loves puppies but was so intimidated by the situation that she ignored everything and everyone. When I put her on the ground, she cowered behind my legs. The only time she relaxed was when she was curled in my lap. I was hoping she’d connect with one of the dogs, but that was too much to ask. There were too many dogs, and she just shut down. I learned something else yesterday. I’m not ready. I keep thinking about what will happen to her if we bring another dog in the house. She’s still coming out of her shell, and I’d hate to reverse her progress. It may sound silly, but I don’t want her to lose her status as the “pampered pooch” of the house. If we bring another dog in that becomes alpha, she WILL lose her favored position. And I’m not ready to do that. So I think we’re going to shelve the “get a second dachshund” decision until we’re settled in our new home back East. After the dust settles and we’re all comfy in our new lives, we’ll revisit the question. Until then, Jasmine will be an only dog. P.S. If you’re in California and are interested in any of the dogs described above, please go to the Southern California Dachshund Rescue page. One of my–and Jasmine’s–favorite times of day is “Bone Time.” After getting through email and various bits of business, I go out and run errands. When I return, Jasmine usually gets a bone as a treat for not destroying the house. I also believe that this helps her equate my going out (and eventual return) as a positive experience, making her less inclined to separation anxiety. But that’s just a guess. WHOOOOOO HOOOOOOO! She explodes with joy! She leaps in the air, tail wagging, body wriggling with pleasure. She runs into the kitchen and waits for me, all the time her tail showing her happiness. She sits, tail still wagging, and she gently takes the bone that I extend to her. She then runs back into the living room to enjoy her prize.